Off the bat, I have to say, I love this shade of blue on the Under Armour men’s webbed belt. We’ll call it “Navy blue”. I’m also a sucker for gray, as fate would have it. No, I’m not a Cowboys fan- by any stretch. You are definitely limited by my color choice, though. You’ve got 11 others to choose from. I’m confident there’s something UA has to offer you. Initially, when these type belts started coming out a couple years ago, I thought they looked very cheap and could really only every look good on those that were 25 yrs old or younger. I’m changing my tune on that quick. I think Under Armour and Nike have stepped up their game. 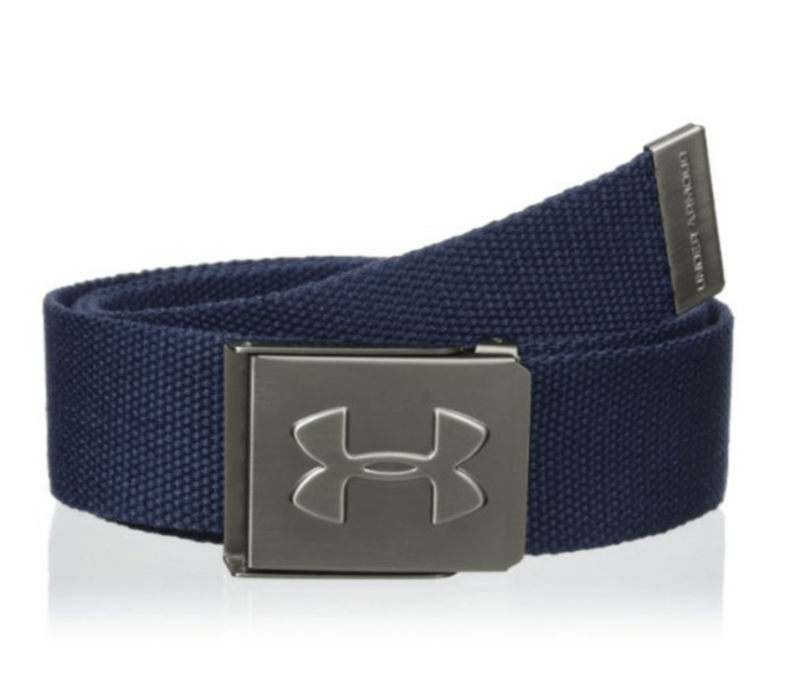 I read a ton of reviews on the Under Armour web belt before pulling the trigger. You can see for yourself, here. It’s about as highly-rated as they come. It looks great with all my golf shorts or pants and matches nicely with a number of my golf shirts. In fact, I wear it into the office on occasion. It holds up well when I’m wearing just jeans and a t-shirt. It’s versatility isn’t something I fully thought out before buying, but I’m sure appreciating it now. One thing I’m really not getting is the bottle opener on the reverse side of the belt. Not a big deal, but seems rather useless. I got bottle openers at the house and I don’t recall ever being served a glass bottle by a cart girl at the golf course. Gotta be something because Nike does it too. Whatever.. Under Armour embossed belt buckle with bottle opener on reverse side. Bonus: Looks great with my new Under Armour quarter zip mens top I just picked up! I’m recommending this bad boy. Hit the link below to get yours.